People are familiar with categories of objects. Names of categories—trucks or cars, weeds or flowers, big or small—are part of our everyday language. Consider human populations of long ago, before technology, before any real understanding of science. These ancient people identified some plants as food, others for medicine, still others for building shelter or for crafting weapons. Classifying objects is a natural human tendency. Putting objects in groups and categories provides some order to the diverse world we live in. 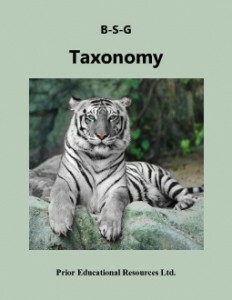 This biology study guide unit is dedicated to Taxonomy, the classification of organisms. It starts with an examination of binomial nomenclature before extending to taxonomy itself, where the seven major taxons are described. Included is a discussion of the relevance of four guiding Principles of Taxonomy, namely evolution, biochemistry, embryology, and homology. This study guide unit concludes with a look at the Domain and Kingdom approach to the classification of organisms. Taxonomy is excerpted from our Biology 11 Study Guide, which is the fourth edition of a student study guide written to match the curriculum of British Columbia. The concepts presented are applicable to the biology curricula of other educational jurisdictions as well.